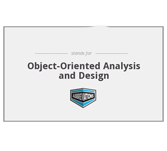 What is Object Oriented Analysis & Design? This tutorial helps in understanding the object-oriented analysis and design basics including its related terminologies. This tutorial is useful for beginners who wish to gain good knowledge and become expertise. Before starting with this tutorial, users should have basic understanding of computer programming and its associated programming paradigms.